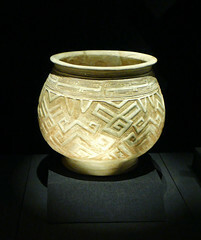 Pottery making during the Bronze Age Shang (商, ca. 1600-1046 B.C.) 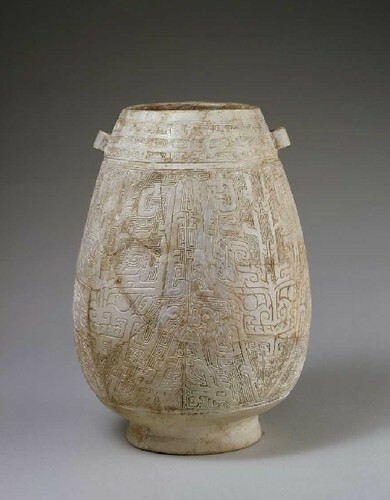 and Zhou (周, 1046-256 B.C.) Dynasties was a large-scale handicraft industry with a marked division of labor. During Shang, several types of ware, such as gray ware, were created, which continued the traditions from the Neolithic Period while the traditions of painted earthenware nearly disappeared entirely. The earliest high-fired glazes were achieved during late Shang. Surviving examples display a glaze with a brownish ash tinge. 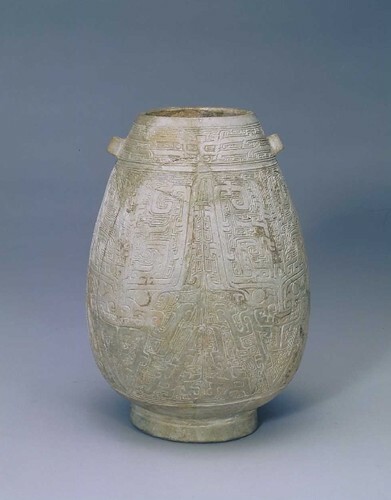 These are the forerunners of Yue ware, a large family of early green wares known as celadon. Also important was the relationship between the bronze industry and ceramics. Throughout the Shang and Zhou Dynasties, expensive ritual bronze vessels and bells were carefully imitated in less expensive clay. These replica vessels were apparently made for burial only and they reflect a wide variety of bronze shapes and decorative styles. By late Zhou, the use of molds and stamped decoration suggests a clear division of labor and assembly line processes, which are necessary for the quality control in the mass production of ceramics.